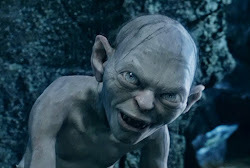 Riddles in the Dark: A Critique - "Gollum breaks down the trailer for 'The Hobbit: The Desolation of Smaug'"
A Critique - "Gollum breaks down the trailer for 'The Hobbit: The Desolation of Smaug'"
We sees that someone writes an article about us. Look, look here precious! We thinks it was nice of the writer, Jancy Richardson to think about us with the trailer for The Hobbitses: The Desolation of Smaug. Nice writing, nice gifs of us. But we wants to set a few thing straight, yes precious? We include bits here, but it should go look at the article itself. Maybe it reads it first, yes? then it comes back to look at us. Stupid Hobbitses, leaving poor Gollum out of The Hobbit: The Desolation of Smaug Not like Gollum cares. This trailer, so full of stinking, stupid Hobbitses. Gollum tells you reasons why he doesn’t want to be The Hobbit 2, those Hobbitses can go desolate Smaug without him. We likes J.R.R. Tolkien. He is our friend. He has us in his book, but only one part. Smeagol is fine with that. Good Smeagol is content with his role. But maybe if we were in it more we could have gotten our Precious back from those stinking, stupid hobbitses. Before we goes to Mirkwood, we doesn't know who this is. We doesn't care about his hat. But he keep Smeagol prisoner! Not very nice, no precious, not very nice at all. 2) Gollum could be that big if he spent his life in Mordor gym, too. Smeagol needs fishes to grow strong. We has no fish, no birdses, only nasty elf bread. Smeagol will go hungry. Poor Smeagol. We doesn't want to look like nasty orcses anyways. And we don't want to go back to Mordor. No, no, we won't go back. Filthsey orcses can get fit all they likes, but don't ask Smeagol to go. 3) Dwarf thinks he can win Middle Earth Olympic barrel race, does he? Olympic? What is it? We doesn't know what it is talking about. But we don't think we like dwarves very much. If it's a race in the water, we would win. We spends lots of time in the water. We paddles with our handses and goes fast. We would win. 4) Baggins! We hates that guy. Yes yes, here we agrees! Baggins, we hates it. Hates it forever! He stole our Precious! Wicked, tricksey, false! More nasty elveses. All from Mirkwood. We doesn't care if it's a boy or girl. We hates them all. It's not a doggie! Smeagol reads the book! We knows what it really is. But we're not sure we like it very much precious. 7) Tasty caterpillars! Oh, no. Eyebrows. 8) Dirty great Dragon! Run for your liveses! We doesn't want to meet a dragon. Not at all, precious. It sounds worse than oliphaunts, yes? We doesn't like them either. But maybe it will eat Baggins. Then we likes it. 9) Gollum busy that day anyway. Those juicy fishes isn’t going to catch themselves, Precious. We may not have said this ourselfs, precious, but it is true. Unless they have fishes in Long Lake? Maybe they have good fishes there. See, Gollum not bothered at about being overlooked for second Hobbit movie. Must admit, though, Precious, the Lego version of the trailer is awesomes. Smeagol didn't expect to be in the other movies. We doesn't mind if they follow what Tolkien says about us. Never heard of a Lego before, but maybe it likes it? Maybe it goes to watch the video on their article? And go see their nice pictures of us. But we knows that "awesomes" isn't a word, precious. Smeagol speaks just fine, doesn't he, precious? Almost three monthses until the movie, precious! Go and see Andy Serkis's good work on it! We hears he is very important! Great breakdown, Smealgol, too bad you can't be in the next movies, but you were really good in the ones you were in. Yes, yes, we were, we knows it! We are glad it likes us too.